Is there ever a point in reinventing the wheel, in recreating what already works? That depends on how much you might improve it and in how much time. Often in the recipe realm we can add interest or healthfulness by changing things up. But sometimes the original recipe is so authentic that we don’t want to mess with it. This recipe, for example. 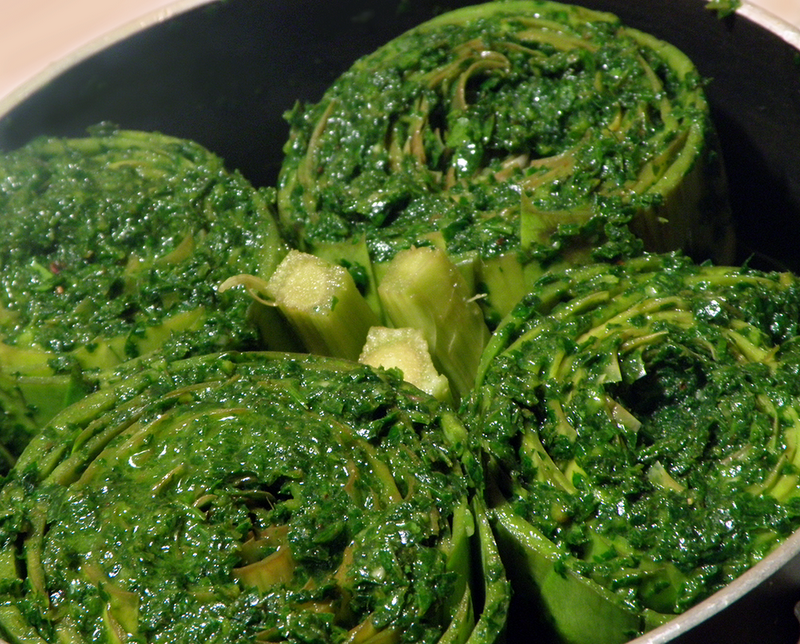 A couple of months ago I knew nothing about carciofi alla Romana, but was looking for an alternative to my usual artichoke recipe. My fellow food blogger at Jodi’s Kitchen & Home posted a link to her rather famous sister’s carciofi alla Romana recipe. Elizabeth Minchilli lives in Rome and writes about “the good stuff in Italy.” Unlike most bloggers also writes non-e-books full of large glossy photos, guides private food tours, and teaches Italian cooking classes. In other words, she’s pretty much the source for carciofi alla Romana. Essentially this recipe involves chopping up a mixture of parsley, mint, and garlic with olive oil and stuffing it between the artichoke leaves. 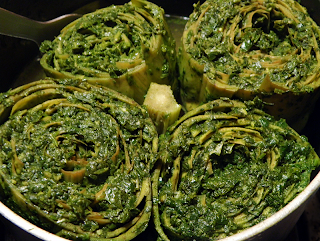 There’s more finesse (and time) required than you might think, and artichokes must be trimmed in a specific way to be sweet and tender. I refer you to Elizabeth’s step-by-step photo essay for complete instructions. She does not write out her recipe per se, so I’ve itemized what you’ll need below so that you can make your shopping list before hopping over to her blog. Do heed Elizabeth’s warning that artichokes can stain hands. Use the lemon as she instructs to avoid this. Take particular care under your nails, especially if you have a “pink collar” day job where such stains might require an explanation. The garden mint that I used had thick tough stems, so I discarded them; use your discretion. I used 2 cups mint leaves and 2 cups parsley and would not advise using less. 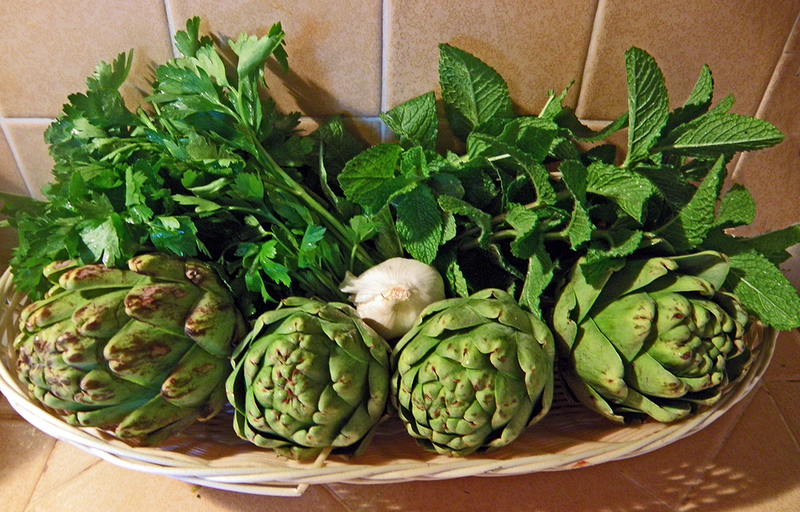 Italian artichokes are a different species than we have in the US. My total cooking time was 30 minutes rather than the 45-60 minutes suggested in the recipe. Follow instructions at Elizabeth Minchilli in Rome. Buon appetito!